Logos and corporate identities are an excellent way of projecting your image. 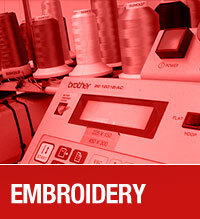 We can embroider onto exisiting products or provide you with embroidered garments according to your needs. Please view our full range of clothing Corporate Workwear Leisurewear Sportswear + Fun Shirts, Stag, Hen, T Shirts. 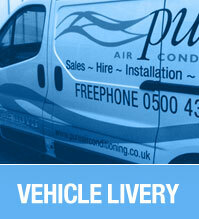 We can design and fit graphics to your vehicles, having fitted graphics to trucks, vans and cars. All your designs are stored in our database so multiple vehicles can be fitted. Weather proof and in a wide range of colours, our signs are designed for both indoor and outdoor use. 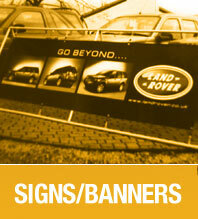 Swinging A-boards are ideal for displaying your logo and special offers. Please check out our monthly offers and deals. About 12 years ago, with the introduction of computer design, a revolution started in Signmaking and Embroidery. Using the latest techniques and modern technology mixed with the skills of traditional signmaking we design, supply and install a variety of signage and display products which will enhance your identity and make your business visible to your customers.